Another of our drought strategies (other then turning the whole farm into a brewery), is pruning trees for cattle feed. This is Brian‘s job. 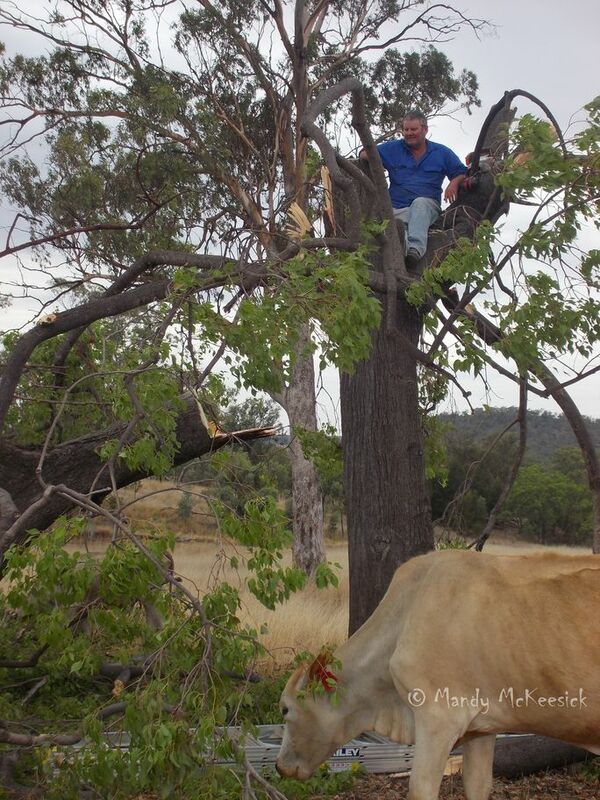 He puts a ladder against a tree, climbs into the branches and chainsaws off some cow chow. So should I leave him there or should I rescue him? This entry was posted in All in a Day's Work and tagged agriculture, drought, drought humour, kurrajong, trees as fodder. Bookmark the permalink. Rick does most of the cooking here too. And a very good one he is! We instituted a rule here about ladders – no one goes up one unless there are two people on site, one being the potential rescuer. Rick broke ribs once when the orchard ladder slipped sideways and he fell into the apple tree. It was the second time he had an accident with the ladder, which was too hastily placed. I wasn’t home at the time. Same rule goes now for bigger power tools. That’s a pretty good rule to have Lavinia. I was away from home doing the grocery run once when I came back to a blood-soaked towel in the kitchen sink. Brian had put a boning knife through his wrist. He had got a neighbour to take him to the doctor, but I guess that shows accidents can happen anywhere and at anytime. Something tells me that you don’t necessarily go rushing there to rescue him – exhibit A is the photo. As are exhibit B, C & D! I was laughing too much to pick up a ladder. That is hilarious! Bet he was glad he had an offsider there! He was when the offsider had finished laughing and taking photos. It’s good that you can still have a sense of humour in the face of drought. I hadn’t heard of doing that before! If nothing else, drought teaches you to be resourceful.